Sebastiano de Corato founded the Azienda Vinicola Rivera in the late 1940s. He saw enormous viticulture potential in Puglia’s Castel Del Monte region and wanted to bring these wines to the attention of the rest of Italy and abroad. Today the estate is still proudly operated by members of the de Corato family. 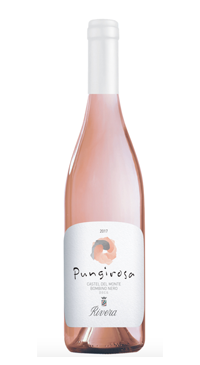 Pungirossa is made from the Bombino Nero grape. 24 hours of skin contact at low temperature, followed by a ten day fermentation of the juice. The wine then rests in glass lined cement vats for 2-3 months. Tasting notes: Purple-flecked onion skin color; delicate bouquet with notes of wild rose and cherry; crisp yet smooth palate, well balanced, with a subtle vein of acidity; lengthy, juicy finish.